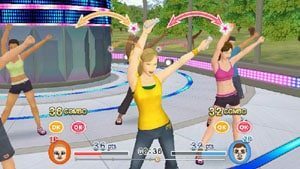 Namco Bandai have recently unveiled that they are to publish an interactive fitness experience titled ExerBeat that is to be released exclusively for the Wii. Tasking players with an assortment of over 150 simple yet challenging exercises, ExerBeat offers a diverse range of activities encompassing a variety of categories including dance, martial arts, body conditioning, and quirky mini-game type party games. It also supports both the Wii Balance Board (sold separately) and Wii MotionPlus, which serves to expand the range of gameplay options further. Up to two players can also exercise together, through the use of two separate Wii Remotes. To aid you along the way, in-game personal trainers, customisable programs and data for calories burned have all been implemented to ensure that ExerBeat provides a robust virtual workout studio for the home that will encourage a healthy, ongoing fitness routine. Your in-game personal trainer will help to customise workout programs based on your own preferences, with daily and weekly challenges being used to motivate players to achieve accomplishments on a consistent basis. You’ll be able to measure how many calories you’ve burned which will also be recorded for your reference. On-screen instructors enhance the training experience as they provide direction as well as fitness tips and feedback to guide players. In addition to this, an ‘Around the World’ mode will convert your workout results into an equivalent distance walked across a globe, which will provide a visual representation of your progress as you witness your Mii character travelling the world and visiting nearly 100 different locations. Each landmark you visit will unlock new exercises, modes and interesting facts about local culture, providing an enriching experience for both mind and body. ExerBeat will be available across Europe and EMEA within Spring 2011.